All members who pickup on Tuesday will pick up on Monday July 3rd 5-7:30 on the Mason’s front porch! We will post this announcement at the top of every newsletter until the 4th of July. We are just back from our weekly crop walk around the farm and stand in awe and wonder at the productivity and yields of our farm this spring. We have been busy implementing many changes that are making the farm more productive and improving our quality of life. This spring we finished a new walk-in fridge, updated our wash/pack shed, a dedicated vehicle and refrigerated trailer for market, csa drop offs, and deliveries. We built a new greens spinner for hydro-cooled (remember, not washed,hydro-cooled!) baby greens, bought new implements for our tractors and a new transplanter, and hired more employees. These improvements are all amazing and really changing the way the farm works for the better. We want to do this work not just in our 30s but for the next 30 years and having appropriate tools has made the work much easier on our bodies this year. We are attempting to create more ease in all the ‘bottlenecks’ and all the parts of the farm that are physically unsustainable. One big bottleneck for us has been that up until three weeks ago our copious amounts of baby greens were rinsed and spun to dry in a hand cranked spinner. Jay stayed up late a couple night in a row and with the help of Youtube videos, hacked a washing machine to become a greens spinner. When using this new tool for CSA harvest last week, we didn’t spin dry the lettuce mix long enough and some of the CSA lettuce was way too wet when it was bagged; resulting in a very short shelf life. We are so so so sorry about this! We pride ourselves in our high quality greens and love hearing how long they keep for our customers. We are taking this as a learning opportunity. We will add a timer and have a ‘set’ time for the new greens spinner to ensure the greens are dry. As part of our "new equipment" learning curve, we are excited to include an extra 8 oz lettuce mix in all our partial shares and a 16 oz lettuce mix in all the full shares this week. We are so grateful for each and every one of you! Green Onions-I keep a chopped up bowl of green onions in the fridge in a lidded glass Pyrex bowl and pull it out for a great topping to ANYTHING! Kohlrabi- kohlrabi is the weirdo in the box this week. We hope you love it but understand that many people don’t (love it). If you fall in the later camp take heart that it is something we only include in the shares 2-3 times a season as we know not everyone loves it. Here is how we prepare it most often; peel and cut in half then thinly slice the kohlrabi into thin half moons and use to eat anything you would normally eat with crackers; chicken salad, cheese, potato salad, hummus, etc., it is also good thinly sliced and added to a sandwich. Peeled and shredded-get out a grater or food processor and shred these lovely kohlrabis and for a kohlrabi slaw or shredded salad. Also! The leaves are edible and good sauteed. They are similar to kale and can be stir fried/braised. Napa Cabbage and Cilantro- pretty much a match made in heaven! Napa cabbage peanut sauce with cilantro is happening in our house this week! The CSA list you get each week is a guide, and not set in stone. Sometimes crops bolt or get bitter or damaged in the days between when we write the newsletter and harvest day. We don’t package things as much as when we take them to market. 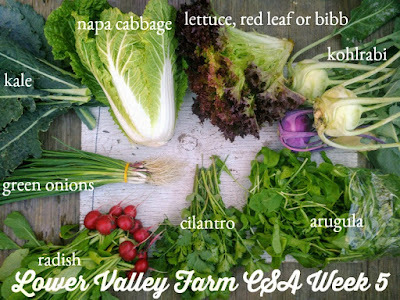 We don’t label them and we hope the csa newsletter photo with words on it as your weekly guide. We love minimizing packaging and labels. For 100 members to get, on average, two bags of greens (or micros/shoots) per week that saves 4000 labels and twistie ties when we don’t use those in the shares. AND! It saves us time! Pretty cool! That said, the CSA is a work in progress and we value your feedback greatly; so please don’t hesitate to let us know if you are having a hard time identifying greens or if the greens are falling out of the bags (no twistie)...etc., we love working together with you! We very carefully record the amounts and values each week and make sure we are staying ‘on target’ with value for the week. In general the baby greens are 8oz for full share and 6 oz for partial. 8 oz is our ‘regular’ size at market and 16 oz is the ‘large’ market size. We don’t usually put a full pound of baby greens in the shares because at 7 dollars it’s hard to get a nice diversity of produce in the box and still not go over the weekly value. We LOVE your questions and feedback about what’s in the shares. Don’t hesitate to ask!